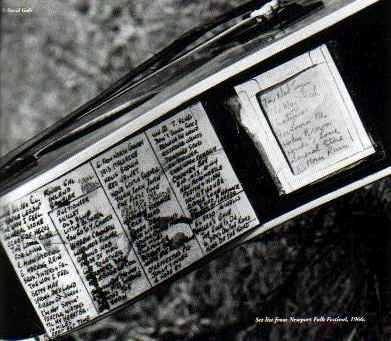 In a great 1965 photographic piece by David Gahr surrounding the Newport Folk Festival of that year, are numerous pictures of a youthful Lightfoot in white shirt and black vest, with Ian & Sylvia, Donovan and others, but the best one of all in my opinion is a close up shot of the top of GL's guitar that includes the songlist he was working from in that period taped to the top of his guitar. This first section was made up of GL originals, the second section was made up of covers Lightfoot was doing live in those days and the third section, located off to the side was perhaps his Newport setlist. Section 3 - Newport '65 Setlist? Overall, this list taped to his guitar in 1965 is a fascinating insight into where Lightfoot stood musically in that period. The influence of Dylan is obvious in his choice of material, as well as to Ian & Sylvia, Bob Gibson and others. Cover songs such as "The Auctioneer" "Farewell To Nova Scotia" and "Tennessee Stud" remained in his stage show for many years, into the 90's in some cases.